I passed the new style (single exam) NS0-154 NetApp Certified Data Management Administrator (NCDA) test today. I had the good fortune to take some instructor led courses for this from Fastlane – Data ONTAP 8.0 7-Mode Administration (DOT87M) and Accelerated NCDA Boot Camp Data ONTAP 8.0 7-Mode (ANCDABC87). They were good preparation. The exam was 75 questions, 90 minutes. I passed it with a 99% (missed one) and it took me maybe 20 minutes. These NetApp tests are “low volume” – that means that there’s not enough people taking them to justify publishers to write prep books, or test prep publishers to make practice exams. Therefore there is little official test preparation material available short of instructor led training. I was fortunate to get ILT, but each of my one week classes cost something like $5000, pretty pricey for those on a budget. NetApp has a pretty good downloadable study guide named NCDA Bootcamp Training Review (free NetApp on the Web (NOW) account required). They also have a semi-cheesy practice test for NS0-154 that’s like 20 questions, and always the *SAME* 20 questions. It’s better than nothing. An important note is that NetApp recently changed the way they tested NCDA. There originally were 2 tests – NS0-153 “Storage Networking Professional” and NS0-163 “Data Protection Solutions Professional”. You had to take both exams to get NCDA. These exams covered the (old, deprecated) Data ONTAP 7.X. When Data ONTAP 8.0 7-Mode came out, NetApp decided to consolidate both of the topics on the former exams into one new exam, the NS0-154 “Data ONTAP 8.0 7-Mode Administrator”. So although the new single exam is for 8.0, and has some new features on it, in general, they just consolidated the questions from NS0-153 and NS0-163. So any test prep materials you can find for those 2 exams will be helpful. NetApp also has semi-cheesy 20 question practice exams for NS0-153 and NS0-163. I studied my course books and the NCDA Bootcamp Training Review. I did the semi-cheesy NetApp practice exams for NS0-153, NS0-163, and NS0-154 until I was blue in the face. Congrats on this, I know it’s a year old, but I’m just now in the ANCDA boot camp and will be taking the test at the end of the week. Can’t believe it only took you 20 minutes and you only missed one… Great job! Was the test just super easy, or were you just super prepared? how many years of NetApp experience did you have prior to taking this exam? Not too long actually, maybe 1 year or so. Thanks for sharing the information Greg. Will be attending the exam in 2 weeks. Just wanted to know did this certification helped in your career growth? In my current position, we use NetApp, we don’t sell it. 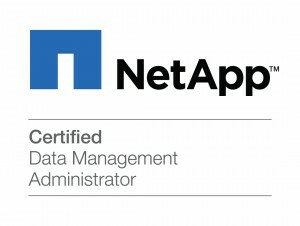 The NCDA certification is important to employers that sell NetApp. I noticed an increase in the number of unsolicited job offers from NetApp vendors I received after I got NCDA. Greg, what was involved in the NCDA bootcamp did you just sit there and take notes? was there labs? did u need a laptop? See my page on the bootcamp I attended – http://greg.porter.name/wordpress/?p=1482. There was good labs, my training center had workstations, so a laptop was not required. You call the practice exams cheesy, however, how relevant were they? Hmm, good question. There aren’t many of them, and you always get the same ones, but they are similar to the ones on the test. So I’d do them, they are better than nothing. Good luck! I’ve been supporting two inherited Netapp environments for the last few year (with lots of help from their suuport team and google) but I finally got the green light for training.. My worry is that the Boot Camp course maybe be too advanced and the NetApp Basic Admin course too basic and I am unlikly to get both courses so at what level is the Boot camp course aimed? I am NetApp NCDMA, NCIE:SAN and NCIE:B&R certified with over five years advanced NetApp administration experience and I cannot find a job. NetApp certification means nothing in the IT job market. I agree, they are certainly “low demand” certs, but when someone wants one, they usually really want it. Just last night I was looking for jobs at SAIC, General Dynamics, and Lockheed Martin and they all had open jobs for NetApp storage guys with NCIE certs. I have gathered a lot of stuffs from NetApp study docks,university but would like to pursue for Certification NS0-154. Can this document “Data ONTAP 8.0 7-Mode NCDA NSO-154 Certification” build my knowledge before attending the paper. Greg, I just want to ask one thing about Netapp Certification. I dont have exp on Netapp and thought to complete course on netapp. If i complete certification means i can able to get a job on netapp ?? @Jeff Walther Jeff, where do you live? I have many certifications. I would say that the ones that seem to trigger recruiters paying attention to me are the NetApp certifications. I get more interest from these than VMware or Windows certifications. Of course, that may just be a local thing.